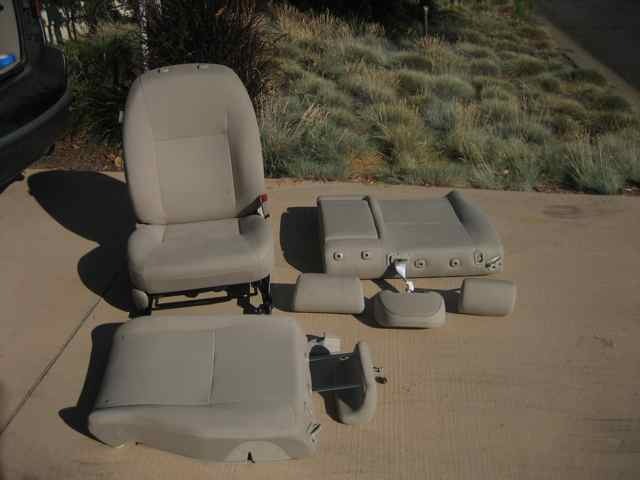 The first step is to remove all the pieces of the seats that you can. Everything was just bolted down with easy to get to bolts so it wasn’t hard. Out came the front seat (slightly tricky since it’s attached to the floor by a set of wires for the seatbelt detection system (when there’s no one sitting in the front passenger seat it turns off the passenger airbag). The backs of the other seats were easy though unfortunately I couldn’t take out the bottom parts of the back seats. Now all three of these pieces will be living in my parent’s garage. Next came building a support for the bed. I pulled the main board of the bed out of the van and was just plopping it down in the prius. In the back it just rests part way down on the “floor” of the trunk, but in the front it needed something to hold it up. It’s hard to tell in this picture, but the bar is is attached to the car through the same holes where the seat was attached. One of them is at a strange angle so it was a bit of a pain to make it work, but this way there’s no damage done to the car. In the van the supports were also attached to frame this way as well. The only “damange” I’ve left on the van is the sticky stuff all over the walls from the Velcro that held up the curtains. Now that the bottom of the support was secured the rest of it could be put in. This is a piece a plywood attached to the bar on the bottom. Attached to this are the two L shaped metal bars that are then screwed in to the bottom of the bed. I realize now I should have taken another picture between this one and the next one to better show how far up the bed comes. The board sticks out in front about as far as the seat would be but it’s a bit higher up. 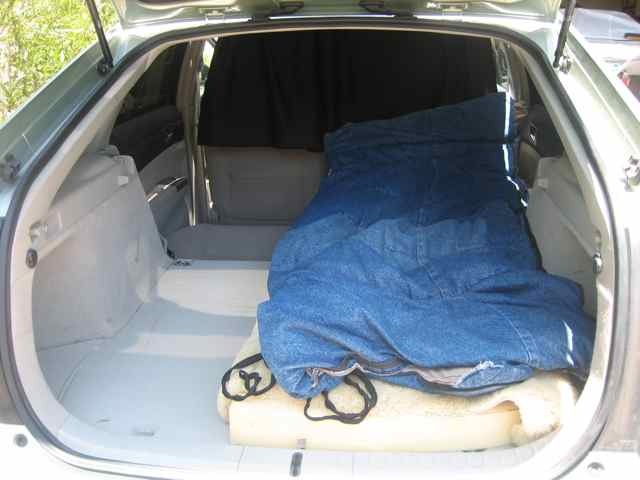 It goes back far enough to rest on the “floor” of the trunk, but not all the way to the back. There’s about a five/six inch space between the bed and the seat in the back where I’ve stuffed a small blanket and my jackets. There’s a bunch of space at the feet back passenger seat. I’ve got a couple boxes and small drawer there. My large drawer (the one that I used to stuff all my clothes in, is now in the front on the floor. I haven’t decided how I like it there yet. It’s so large and so full of stuff that it’s kind of difficult to open, but it does fit nicely in the space. I’ll just have to try it out for a while and see how I like it in the long run. The pad, (and therefore also me when I’m sleeping) is half on the board and half on the floor of the trunk. The board itself is sticking out about a foot and a half past the curtain you can see in this picture separating the front and back of the car. The intention is to screw down a box or something on the front part of the board so I can put stuff on it that I’d want to get to easily. I didn’t really have time to consider what exactly I want there so I’ve left that as just the board for now. I basically can’t put anything there while I’m driving though because after a couple turns it ends up on the floor. I didn’t think to take a picture of the curtain and how it’s attached. 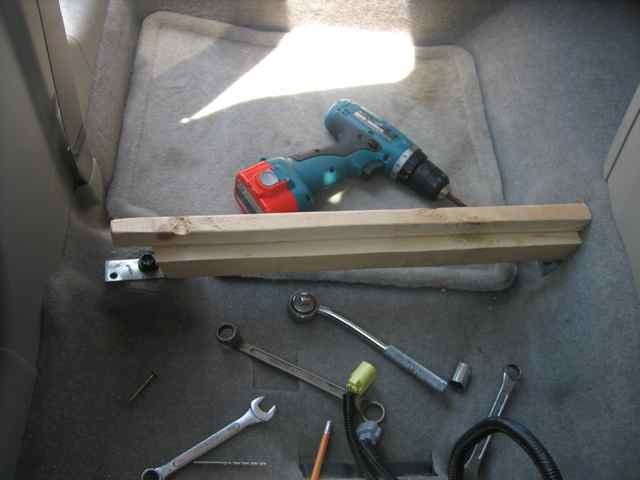 Dad figured out that for me (as well as figuring out how to do the bed support without damaging the car. Basically there’s space in the paneling on either side of the car above where the seatbelt attaches. He cut and bent the ends of a curtain rod so that they slid into those spaces. Then I took the same black cloth from the van and threw it over this rod. As a side note, if anyone out there is picking out fabric for curtains let me highly, highly recommend you go with black. Even during the daylight if you’re standing in front of the car looking through the windshield it’s hard to tell the curtains are even there. It just looks black and someone walking by isn’t going to even think there’s curtains there, they’re just going to think it’s dark in the back. Actually, that’s not true. They’re not going to think about it at all. I’ve seen light colored curtains and I feel like they really stand out. Sure they block the view to the back, but they also draw attention to the fact that you’re blocking the view to the back. On the left of the above picture you can see the space I had to work with for the easily accessible storage. There’s also space under the bed that I can get from the inside as well, but it’s slightly more difficult. 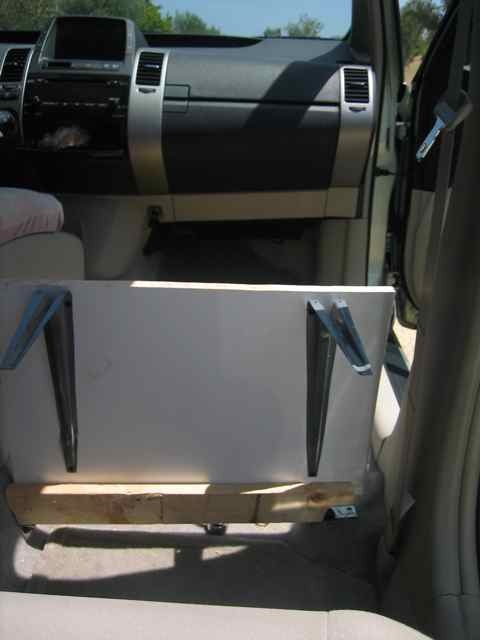 I knew I wanted my two drawers of clothing to sit on the front of that space so they would open over the area where the passenger would be sitting in the back seat. 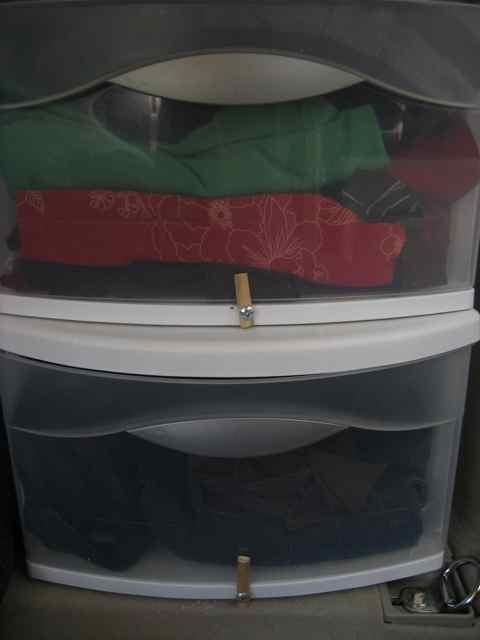 Then I could put a couple bags (the large grocery tote bags which have become one of my favorite organizing containers) between the drawers and the back of the hatch without worrying about those flying around. So I knew that’s where I wanted them, but the tricky thing was figuring out how to secure them so they don’t go flying around while I’m driving. First came the latches to keep the drawers from opening. these are the same kind I have on the large drawer. Just a piece of wood (half of a dowel) cut down and screwed into the plastic below the drawer. Next I had to figure out a way to keep the drawers themselves from sliding around when dad had the great idea of checking to see if Velcro sticks to the fabric on the floor. It does. So there’s Velcro on the bottom of the lower drawer keeping it attached to the floor and then a set of Velcro between the two drawers keeping the top one attached to the bottom one. I neglected to take another set of pictures of the “finished” product, but I’ll be tweaking it as I go anyway. Also, I spend a lot of time doing the first half of all the packing, carefully stowing things away in well-thought out spots, but by the end of the evening I end up just tossing things on the floor of the front seat. I’m sure I’ll spend the next couple days sorting through that and actually putting things away where they ‘belong’. The most pressing project at the moment is figuring out a way to make some curtains. The windows are tinted, but (especially in a space this small) I really want some curtains. But this is my car and my little baby and I don’t want to end up with sticky stuff from the back of Velcro all over the walls and would prefer not to screw anything into them either. Hopefully I will figure it out within a day or two. Alternately, 3M Command strips are great for permanent-’till-you’re-done-with-it mounting. They have good holding force but when you pull their tab, the foam stretches out, somehow destroying the adhesive in the process leaving the surface clean. And yes, I am a 3M employee. >>And yes, I am a 3M employee. Mom has some goo for removing the sticky stuff, I just kept forgetting to do it. I discovered to my great joy last night that Velcro also sticks to the ceiling of the car. I think over the long run that would fuzzy out the fabric, so it’s just a possibility, but I’ll check out some of the 3M stuff. In previous cars, I have had good success with little spring clips that go over the molding at the edge of the headliner. I am not entirely certain what the edge molding treatment on a Prius looks like, as nobody I know here has one, however. In any case, Ace Hardware’s drawers o’ stuff tends to have useful things like that, and I’d imagine that they’d do very well for curtains. Also, you might consider some of the ridiculously strong rare-earth or neodymium magnets, as they have enough strength to magnetize through the headliner and insulation. Just thought I’d let you know I am still following your blog. Perhaps even a bit enviously, it’s quite an adventure. How are you doing with the outrageous price of gas? Hi Lisa, thanks for the comment. I’m having a great time. Now that I’ve switched to the Prius the price of gas suddenly doesn’t seem like very much. Generally though I’m much more happy to pay for gas than to pay rent. I don’t think there is a “best” type of work for someone vandwelling. All depends on what you like to do and how you want to live. Do you want to travel a lot or stay in one place? I haven’t had any trouble maintaining my car, but then again, it’s an ’07, so I’d be pretty upset if it broke down! Food isn’t as big a deal as I think a lot of people expect it to be. I just buy less when I go to a grocery store but go more often compared to when I lived in an apartment. I don’t plan food ahead much. As for mail, I have a bit of a cheat there. My parents live in San Diego and I work in LA so I use their address. Many people get a PO Box. If I order something online I have it sent to my work address. I have all my bills set up to pay automatically by credit card and then I pay that online. Hope those answers help. Good luck! Jessica, I do not have a prius but a pontiac vibe and I will be living in my soon. Is there a way you can show how your dad created the curtain for privacy. That is my main problem right now. I am thinking I will tint the side windwos. The hatch back window, I will be taping black 30 gallon garbage bag every night but I would like to create the privacy curtaing that your dad did between the front and back seats. I am a visual person and I do not understand well how he attached the curtain rods and what they look like.